Georgia Southern University was one of six post-secondary schools nationwide to be recognized as a 2018 U.S. Department of Education Green Ribbon School Postsecondary Sustainability Awardee at a ceremony in Washington D.C., on Sept. 19. 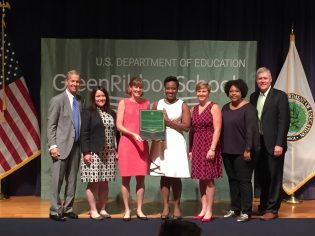 The U.S. Department of Education Green Ribbon Schools award is the highest honor given by the U.S. Department of Education for sustainability. On hand for the ceremony to present each recipient with a sustainably crafted plaque were Assistant U.S. Secretary of Elementary and Secondary Education Frank Brogan, National Oceanic and Atmospheric Administration Education Director Louisa Koch, Director of the Campaign for Environmental Literacy James L. Elder and Director of the Center for Green Schools at the U.S. Green Building Council Anisa Heming.